The rising hulk of steel and concrete was erected 30 years ago near Rondo Mogilskie as part of an audacious plan to complete a series of high-rise buildings that would dominate the Krakow skyline and give testament to the modernisation of the city. It was a dream the communist authorities at the time held dear. But with the decline of the regime came an abrupt end to those plans. The finished core of the building has stood ever since, home to birds, graffiti and most recently, giant advertisements promoting blockbuster movies. Last month, an investment group called Treimorfa, the latest owners of the property that contains the so-called Skeletor structure, announced revised plans to develop the tower and the area around it. Treimorfa is composed of a mixture of investors including Krakow development company GD&K Group. The new plan calls for completing the 102.5m high-rise in a style similar to buildings seen in parts of central Manhattan in the United States. 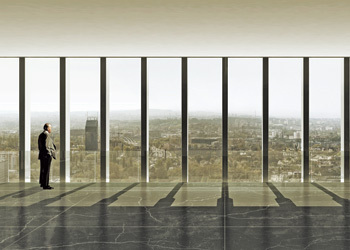 The tower, which when finished will be 10 metres higher than it is now, would become home to offices, a top-level restaurant with a panoramic view of the city and performance and display spaces. It would be the centrepiece of a plaza of smaller buildings for a hotel, more offices, cafes, shops and parking. The entire project will likely cost about 100 million euro, said Henryk Gaertner of the GD&K Group. The plans for the development, which would include six buildings with more than 30,000 square metres of usable floor space, were scheduled to be presented in a series of hearings before the city in late June to gain permits and other permissions. The mayor of Krakow, Jacek Majchrowski, was present at the unveiling of the new plans in mid-June, a signal to some that this project has some official support. Any development of the site is controversial given its history and that it would be the most dominant structure on the skyline. Some have voiced opposition based on arguments that the tower would mute the effect of the city’s current architecture, particularly the Old Town with Wawel Castle and its Renaissance, Baroque and Gothic buildings. The centre of the city was declared a UNESCO World Heritage Site in 1978. Chief architect Marek Dunikowski of DDJM, an architectural firm with offices in Krakow and Warsaw, says the new design will draw on the best features of those styles, along with ideas from other significant buildings in the city, such as the National Museum, in an attempt to blend in the tower with the cityscape. But while it may draw design inspiration from the past, the “guts” of Skeletor may become quite modern. The building is planned to have open floor plans that suit modern office designers and should be replete with high-tech capabilities. If the project receives the proper permits to begin work, the developers hope to have the tower completed within two years.